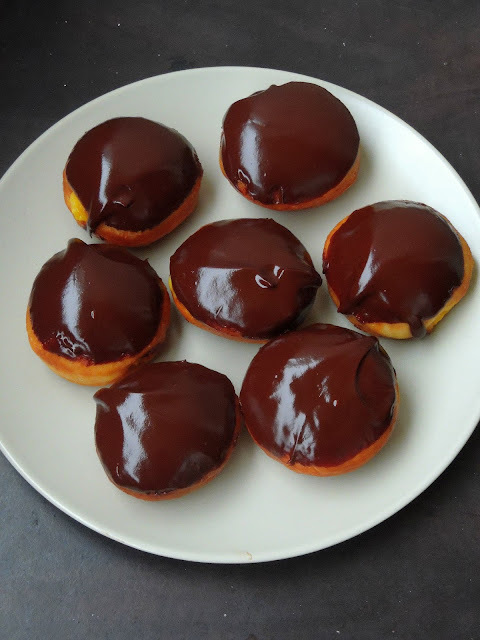 Donuts or doughnuts are my kid's favourite and my younger one was asking me to make some Nutella Donuts which is our family favourite as well. Since i stopped buying nutella now, i dont want to dish out those donuts hence i opted for this ultimate cream donuts. Though this donuts is bit long to prepare, its seriously worth to try these cuties. 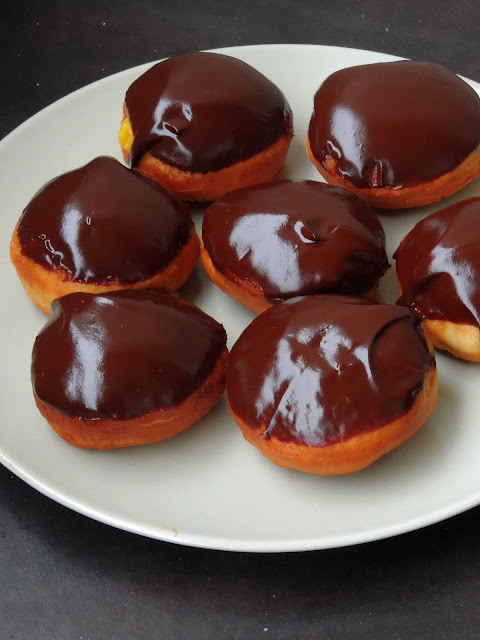 The best part of making this donuts is the assembling : piping the vanilla cream inside the donuts and giving the final touch with chocolate frosting. Seriously i enjoyed thoroughly making this donuts and these cream doughnuts is a big hit among my kids. If you are looking for a dangerously delicious donuts to please your tastebuds, dont forget to check this incredible doughnuts. Take the all purpose flour,yeast in a bowl, add the milk, melted butter, sugar, salt and mix everything together. Knead the dough well until it turns smooth and slightly sticky. Lightly flour your working surface and knead the dough for few minutes. Punch the dough and roll the dough 1/2-inch thick with a floured rolling pin. Cut dough using a round cookie cutter or else with a round glass. Cover the donuts and let them sit to rise atleast for an hour. Heat enough oil for frying, and fry the donuts both sides until they turns golden brown. Remove the excess of oil with paper towel. Heat the milk in simmer, meanwhile whisk the egg yolks with sugar and vanila extract. Add the hot milk slowly and whisk everything, transfer this mixture in a saucepan and whisk until they turns thick in simmer. Pour it in a bowl and cover it with a clingfilm right on the surface of this pastry cream to prevent the skin forming and cool it completely. Melt the dark chocolate chunks with butter in microwave for 30 seconds. Mix well and make a silky chocolate frosting. Using a skewer or a sharp knife, make a hole on the side of the donut and then fill it with pastry cream. 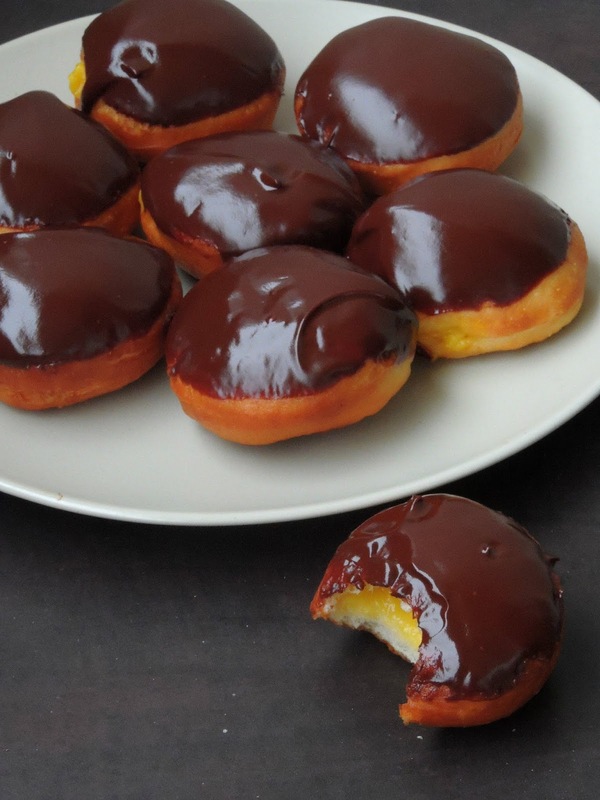 Now dip the top of the cream filled donuts to the chocolate frosting. Arrange on a wire rack and let it sit for a while until the frosting gets completely set. Enjoy the donuts for your snacks or for your desserts. Mini donuts are are cute. i am sure it was much loved and appreciated deep fried sweet treat. OMG, that is sinful priya, look at that chocolate topping, calling my name!! totally droolicious, wish i could grab a few from the pictures! 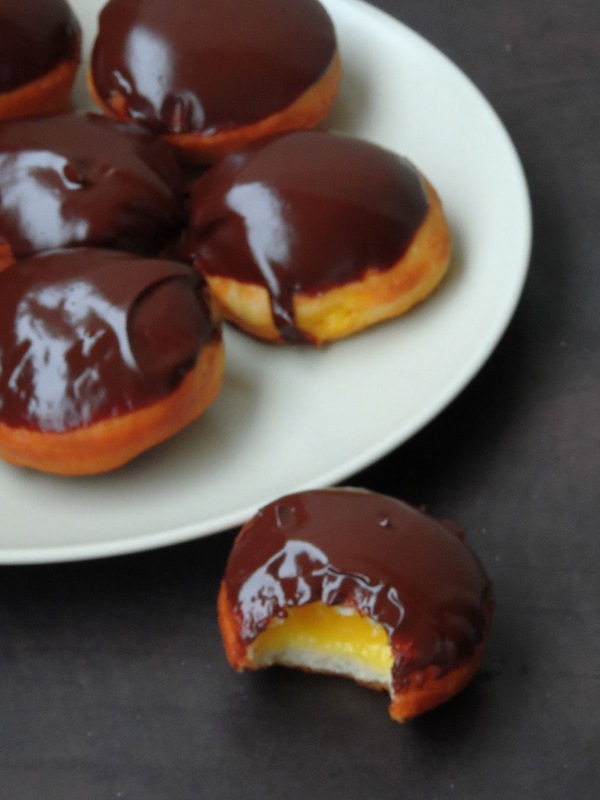 I am literally drooling over those inviting Boston cream donuts. These are such rich, decadent and sinful treats. Yummy!! These donuts look so tempting with chocolate with shinning ganache, just want to grab a piece and eat away.. my kids keep on asking me to make donuts at home, your donuts are tempting me to do this soon.. awesomely shot pics!! I have never tried this because of eggs but it is one decadent dessert. I haven't yet tried filled donuts. 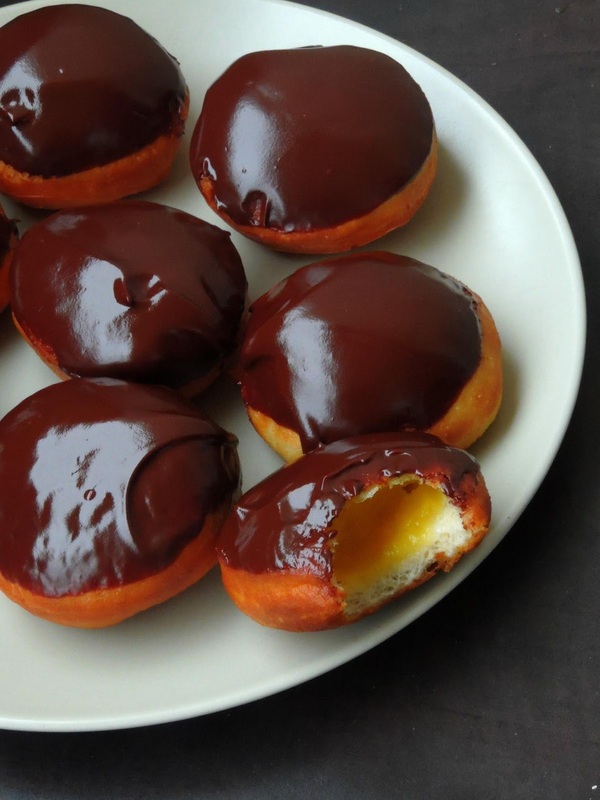 These cute mini donuts with the pastry cream filling and chocolate glaze looks awesome Priya. Though I am not deep frying anything now, I am too tempted. oh my these are looking so sinful Priya, what an addictive one..
if I will show these mini donuts to my place everyone will make me cook these asap. looks so tempting and mouthwatering. nutella on top is such a drooling view. feels like having a bite from the screen.